1. Preheat the oven to 180°C, gas mark 4. Put the peppers in a baking tray and drizzle with 1 tbsp oil. Roast for 15 minutes, add the tomatoes and roast for another 15 minutes. 2. Meanwhile, whizz the kidney beans, breadcrumbs, salad onions, chipotle paste, egg and lime zest in a food processor until combined but still slightly chunky, season, then form into 4 burgers. Heat the remaining oil in a non-stick frying pan and cook the burgers for 4 - 5 minutes on each side until golden. 3. Toss the roast peppers and tomatoes with the lime juice and chilli flakes and season. Halve and toast the rolls. 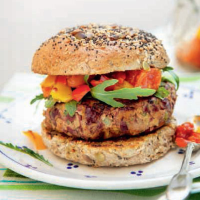 Serve the burgers in the toasted rolls topped with a handful of rocket and the salsa.